Indiana University senior Chesley Swann was already an experienced international traveler. The Washington, D.C., native had already traveled to Ghana through a program at his junior high school and performed in China with the renowned D.C. Boys Choir as part of a music festival. But through IU’s Overseas Studies and Scholarship Program, a unit of the Office of the Vice President for Diversity, Equity, and Multicultural Affairs (OVPDEMA), Swann went to India in the summer of 2015, and came back from the trip with an entirely new perspective. 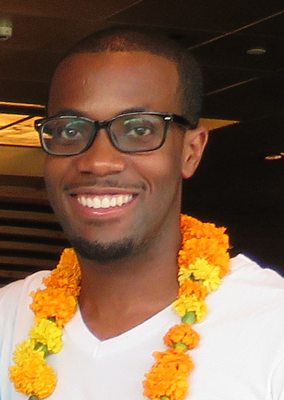 On the trip, Swann and his fellow IU students visited the cities of Varanasi, New Delhi, and Mumbai. IU Maurer School of Law Professor Kevin Brown led the group in studying the relationship between the contrasts and similarities between African Americans in the United States and the Dalit class of India. That aspect of the experience appealed to Swann, who believes traveling through OVPDEMA gave him a different insight and sense of community than other excursions abroad. IU has really provided a space where you can explore, and education is all about that—it’s not just in the classroom. The best students go outside the classroom and learn from experiences to learn more. “By going through OVPDEMA, it was much cheaper—obviously, they provided a bunch of scholarships—and whatever your passion was, they made sure you explored it during the trip. For example, some students were med students, so we visited some medical facilities and saw some of the disparities between India and the U.S.,” explained Swann, who has been involved with organizations such as the Union Board, IU Bloomington’s chapter of the NAACP, and the IU Pre-Law Society during his time on campus. Swann, who says his fondest memory of the trip actually happened in advance—convincing his doting mother to allow him to make the journey was “a big victory for me,” he joked—has some advice for IU students interested in OVPDEMA’s Overseas Studies and Scholarship Program, which is a collaboration with the IU Provost’s office. Students interested in OVPDEMA’s Overseas Studies and Scholarship Program can learn more about it on Saturday, November 12, at the Study Abroad Fair, which is part of IU’s International Education Week. The fair, which will feature activities, international entertainment, and panel discussions, will be held from 1 to 4 p.m. at the School of Global International Studies.